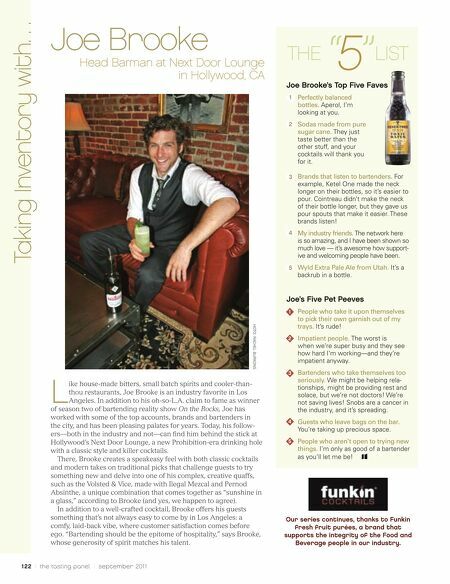 Joe Brooke Head Barman at Next Door Lounge in Hollywood, CA THE Perfectly balanced bottles. Aperol, I'm looking at you. 2 Sodas made from pure sugar cane. They just taste better than the other stuff, and your cocktails will thank you for it. 3 Brands that listen to bartenders. 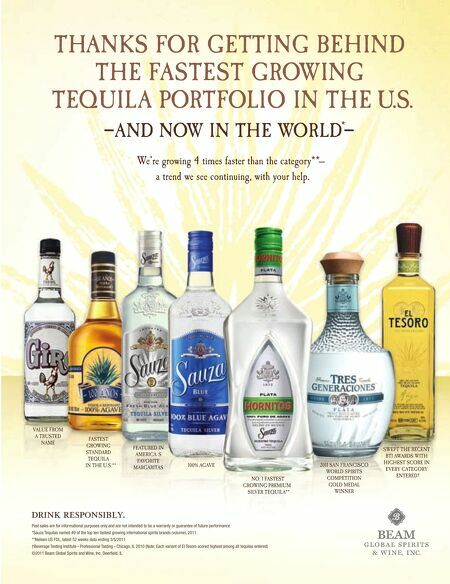 For example, Ketel One made the neck longer on their bottles, so it's easier to pour. Cointreau didn't make the neck of their bottle longer, but they gave us pour spouts that make it easier. These brands listen! 4 My industry friends. The network here is so amazing, and I have been shown so much love — it's awesome how support- ive and welcoming people have been. 5 Wyld Extra Pale Ale from Utah. It's a backrub in a bottle. Joe's Five Pet Peeves 1 2 LIST Joe Brooke's Top Five Faves 1 People who take it upon themselves to pick their own garnish out of my trays. It's rude! Impatient people. The worst is when we're super busy and they see how hard I'm working—and they're impatient anyway. 3 L ike house-made bitters, small batch spirits and cooler-than- thou restaurants, Joe Brooke is an industry favorite in Los Angeles. In addition to his oh-so-L.A. claim to fame as winner of season two of bartending reality show On the Rocks, Joe has worked with some of the top accounts, brands and bartenders in the city, and has been pleasing palates for years. Today, his follow- ers—both in the industry and not—can fi nd him behind the stick at Hollywood's Next Door Lounge, a new Prohibition-era drinking hole with a classic style and killer cocktails. There, Brooke creates a speakeasy feel with both classic cocktails and modern takes on traditional picks that challenge guests to try something new and delve into one of his complex, creative quaffs, such as the Volsted & Vice, made with Ilegal Mezcal and Pernod Absinthe, a unique combination that comes together as "sunshine in a glass," according to Brooke (and yes, we happen to agree). In addition to a well-crafted cocktail, Brooke offers his guests something that's not always easy to come by in Los Angeles: a comfy, laid-back vibe, where customer satisfaction comes before ego. "Bartending should be the epitome of hospitality," says Brooke, whose generosity of spirit matches his talent. 122 / the tasting panel / september 201 1 Bartenders who take themselves too seriously. We might be helping rela- tionships, might be providing rest and solace, but we're not doctors! We're not saving lives! Snobs are a cancer in the industry, and it's spreading. 4 5 Guests who leave bags on the bar. You're taking up precious space. People who aren't open to trying new things. I'm only as good of a bartender as you'll let me be! Our series continues, thanks to Funkin fresh fruit purées, a brand that supports the integrity of the Food and Beverage people in our industry. HOTO: RACHEL BURKONS Taking Inventory with. . . " 5 "